that a visit to the very first BoardGameNews post regarding Mystery Express will yield some visual clues. A little window shopping at the DOW online store will definitely be rewarding. But who is that peeking out from behind the news? I suggest you take a tour – you will learn a great many things. Mystery Express, the new deduction game by Serge Laget and Antoine Bauza, is expected to be available from game stores in Europe on the 25th or 26th of March; and on March 31 in the US. Pre-orders from the Days of Wonder website will ship to arrive around the same dates. Mystery Express is a 3 to 5 player game for those ages 12 and up. The murder that takes place on the Orient Express incorporates 5 different elements represented by a set of Crime cards. 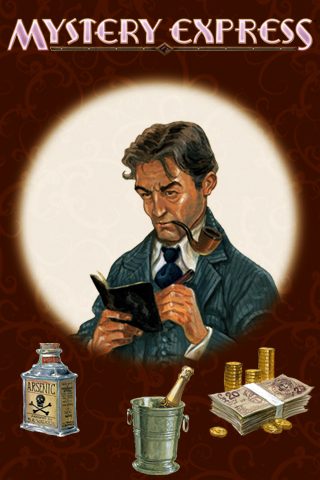 Players take on the role of one of 5 traveling characters, each who has their own special powers of deduction. The player who figures out the who, what, when, where and why of the murder before the end of the journey wins. Learn more about Mystery Express. Mystery Express, new web site and preorders! – Doctor Strauss? Did you see? There’s a new web site for Mystery Express! – Shh! I know, I know! Can’t you see I’m studying the rules already? Mystery Express is now available for preorder… Book your copy on our online store!